Using radiography, we are basically taking internal photographs of concrete. Because of this, we can see exactly what is in a concrete slab and tell the difference between objects such as rebar, conduit and even post-tension cable. With concrete radiography, precise locations of rebar, P.T. 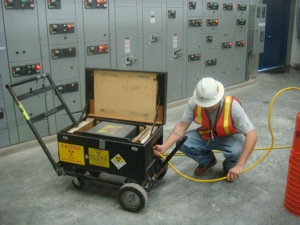 cable and metal conduit can be detected prior to core drilling or saw cutting. This can verify size and spacing of reinforcement in concrete. Results can be used as evidence for litigation purposes. With our equipment and our experience, we can examine deeper into concrete slabs then any of our competitors; up to and sometimes beyond 30 inches. With our on-site darkroom, you will have answers on the spot. This can be crucial if adjustments need to be made based on our results. The iridium source works on concrete up to 12” maximum and the cobalt works on concrete over 12” up to 36” maximum, (depending upon the density, age, etc. of the concrete).